Rachmaninov’s two piano trios date from his earliest years as a composer, January 1892 and December 1893 respectively. 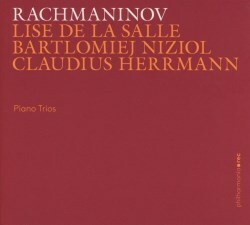 The first trio, to which Rachmaninov did not assign an opus number, was his first piece to have a performance in an independent concert outside the conservatoire. In it we can already hear the characteristic Rachmaninovian flowing, sometimes brooding melody, well suited to the strings. This enables them to compete with the piano writing and add some light to what can be a rather dark work, noticeably when the faster second subject is sung out by the violin. The pianist, Lise de la Salle, is considerate to her partners whilst giving full expression to Rachmaninov’s confident piano writing. The recording is superb, full and warm yet clear, with the cello tone beautifully caught and the resonant decay of the lower reaches of the piano sounding outstandingly natural. I have a Chandos CD of the Borodin Trio performing both trios (CHAN 8341), recorded in 1984 and in my collection since round about then. They are about two minutes slower than the Zurich artists but give an equally good performance. Given that this recording dates from the early days of CD, it is not surprising that even the renowned Chandos sound cannot quite match this new one. I say a bit more about this later in the review of the second trio. Both trios are entitled “Elegiac”. The second, Op. 9, was written as a grieving response to the unexpected death of Rachmaninov’s idol, Tchaikovsky. The autograph score is dated the very day of the shattering news, and Rachmaninov worked continuously for six weeks to complete it. He revised it considerably in 1907 and again in 1917. In the first version, a harmonium was specified for the first statement of the variation theme in the second movement. He might have assigned such an unusual instrumentation in tribute to Tchaikovsky, who specified the instrument at the climactic finale of his Manfred symphony. We know that Rachmaninov knew Manfred well, for at the age of thirteen or fourteen he had transcribed it for two pianos. This performance does not use the harmonium, so I assume that we are hearing the final version of the piece. The first movement begins with a gloomy but memorable theme, as might be expected of a piece begun on that day, but the mood lightens a little later on as the movement progresses in a series of quite strongly contrasted episodes. Overall it is an interesting movement, and given that it plays for about twenty minutes, it needs to be. The second movement is a series of eight variations on a modified version of the principal theme of his Op. 7, “The Rock”. In his revision of 1907, Rachmaninov altered this movement by completely changing the sixth variation—it had been for solo piano—so this is another indication that this is a recording of a later revision. I found de la Salle’s rendition of the opening statement of the theme to be rather slow, disrupting the natural flow of the melody, particularly when compared with the Borodin Trio’s performance, 15% difference, in fact. The melody itself, though pleasant, is not one of Rachmaninov’s most indelible creations. It struggles a little at this speed, and when we get to the second variation, for solo piano, the pianist’s slow approach leads to a whopping 30% difference with the Borodins’ version, which definitely flows better. Admittedly, these are large percentages on small sections of music, but they make a long piece even longer. Now, with regard to the Chandos recording: it seems to have remained unchanged in their catalogue for over thirty years in the face of challenges from the many other recordings issued in that time. This is an indication of the quality of its performance and recording, and I enjoy it very much. In general, the string instruments are given greater prominence in the recorded balance, presumably to avoid them being swamped by the Rachmaninovian piano. I think that this occasionally leads to some aural problems from which the superb Zurich recording does not suffer. For example, in the third variation of the second movement, the frequent pizzicatos on the cello sound too dominant in the overall texture, and in the fourth variation, a dour, often repeated phrase in the lower reaches of the cello sounds like a gruff buzz. I do not want to over emphasize this—I think that the quality of the performance is of much greater significance. The first two movements are long—nearly forty-one minutes in this performance from Zurich—and they completely overbalance the last movement of nine minutes. I suppose that Rachmaninov must have realised that he had produced an overlong work, and so desired to bring it to a conclusion with some dispatch. Unfortunately, in so doing, he created a closing movement that is thematically weak, so much so that when the first theme of the first movement made a sudden reappearance at the end, my ears pricked up with pleasure. Once again, in comparison with the Borodins, this is a slow performance, about nine minutes against seven, but it relies less on melody and so this time its flow does not seem to be compromised. As with the earlier trio, the recording is splendid, with all three members of the trio and their recording producer collaborating to present us with a superbly effective aural rendering of these early indications of Rachmaninov’s blossoming compositional mastery. Perhaps its slowness—it lasts one second short of fifty minutes in comparison with the Borodins’ forty-four minutes—might make it best suited to be a second version in the collection of a Rachmaninov fan. The CD is packaged in a folder, the cardboard outer of which is attached to a plastic tray holding the disk. A three-language booklet is included. With the relatively minor speed caveats mentioned, this release is recommended with pleasure.